Simply swinging harder will not make the ball go farther, take time to work on your mechanics at the range to find the right solution. Many golfers want to get more distance with their shots, whether they are beginners or accomplished players. You might change your equipment or move to a different golf ball. You can also look at your swing, which can provide the key to achieving greater distance. Go back to basics, and reap the rewards with longer golf shots. As the clubhead makes impact with the ball, your arms should be relaxed and stretched out by centrifugal force. According to PGA instructor Krista Dunton, a power swing for greater distance occurs when you create swing speed and hit the ball in the center of the club. Relax your arms as you address the ball, and make sure the left arm and golf club are straight just after impact. Your body should make a centered turn around your spine as the arms swing around your body. Centrifugal force should give your shots more distance. A proper weight shift is essential to achieving more distance. Try this exercise during practice. Imagine a vertical pole where the ball rests during your address. As you make your shoulder turn, move to the point where your let shoulder is behind the pole on your backswing. The hips should not sway. As you complete the swing, your right shoulder will pass the pole on the follow-through. This exercise will ensure a good shoulder turn, the resulting weight shift and greater distance. 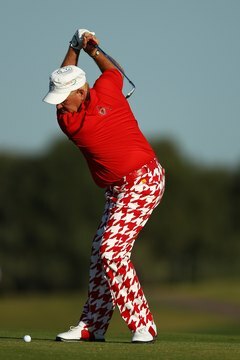 The golf swing does have a big hip turn, but it is on the follow-through and not the backswing. To achieve more distance in your golf shots, make sure your left knee is stable through the swing and not bent inward, which will allow the hips to overturn. In order to create the torque that fuels clubhead speed, the left knee should remain stable and pointed toward the target by the time your arms are at the top of the backswing, creating distance between your two knees. Practice a proper hand release to achieve more distance on your golf shots. Make sure your hands are in the proper position by taking a short backswing, and checking on your hand position when the club reaches the height of your waist. Your hand should have the thumb pointed up, as if you were shaking hands. The hands should maintain that position for the downswing to get greater distance from your golf shots.